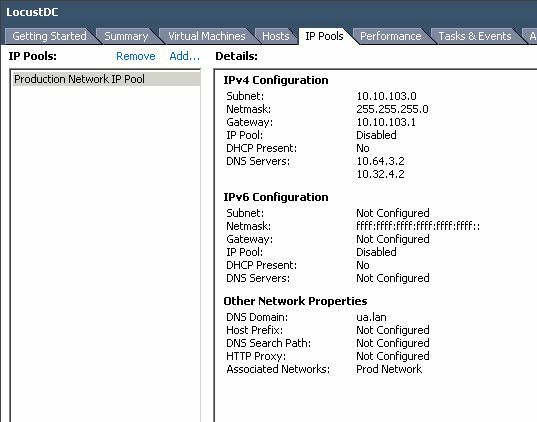 When powering on a VMA template- Cannot initialize property ‘vami.netmask0.vSphere_Management_Assistant…has no associated network protocol profile. I’m new to 5.1 and I’m chugging along, getting my new cluster up and running. Deploying a template was a walk in the park in 4.1. This is where you find out you don’t know what you don’t know. You’ll have to configure an IP Pool in order to get your template powered on. Click on the Datacenter in vSphere client. 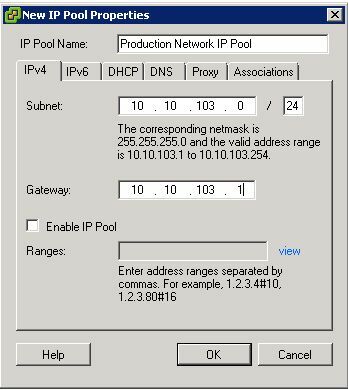 There is a new tab called IP Pools, click on it to configure a pool. Click Add. The New IP Pools Properties box appears. Give the pool a name. Depending on which version of IP you’re using, click on the corresponding tab. Enter the subnet and gateway information as it pertains to your environment. I did not check Enable IP pool and you may or may not have to depending on your environment. Click on the DNS tab and configure DNS as needed. Go through the other tabs and configure them as they apply. Since I’m only using IPv4 without DHCP, it requires limited config. Click OK when you’re finish. You should now be able to power on your VMA template. Duncan Epping wrote a blog post that references the same issue. WordPress blog post on this issue.